YATES – Town officials were praised and criticized on Thursday evening for agreeing to a 50-50 split in legal costs with the Town of Somerset, an arrangement Yates approved in April. Last week Apex Clean Energy unveiled a layout for 47 wind turbines in Lighthouse Wind. Of the 47, eight are planned for Yates or 17 percent of the total. That has some residents thinking the town should only pay 17 percent of the legal fees from Dennis Vacco and his law firm Lippes, Mathias, Wexler, Friedman LLP. Susan and Harvey Campbell both said Yates is paying far more than its fair share. Mrs. Campbell said Somerset has more resources for its 50 percent. The town has money from a PILOT with the power plant and Niagara County has also chipped in with the legal bills. The Yates Town Board was working with Hodgson Russ, a Buffalo law firm. 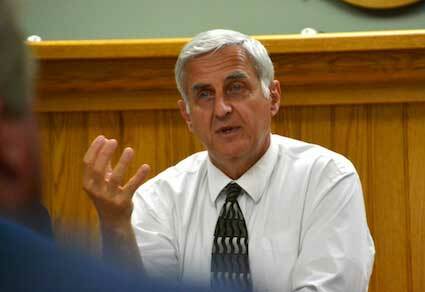 The town decided to have joint legal counsel and went with Dennis Vacco and his law firm. Vacco is a former state attorney general. Kate Kremer, vice president of Save Ontario Shores, praised Yates for going 50-50 with Somerset. “Unequal funding would give us a lesser voice,” said Kremer of SOS, a citizen organization opposing Lighthouse Wind. She expects the costs will accumulate with briefings, depositions and hearings with the project. It makes the most sense to have one legal team, she said. Other residents spoke in favor of the equal split in legal fees. “We’re fighting this together,” said Judy Esposito of Yates. Town Supervisor Jim Simon said on surface it may look like Yates should only pay 17 percent of the costs. He said the full footprint of the project isn’t known with access roads, transmission lines, substations, concrete mixing stations and other impacts. That could push Yates’ “share” of the project above 17 percent. Simon said he wants Yates to have an “even voice” in the legal fight, in determining the direction of the counsel. Vacco, as former attorney general, also is an asset because the large-scale turbine projects are now reviewed in Albany by a state siting board. Vacco “understands the dictatorial system” from the state, Simon said. He noted the administrative law judge from the state urged the towns to share legal representation. That was in January 2016 at a hearing about intervenor funds, the $70,350 Apex needed to provide the two towns and Save Ontario Shores for the initial response in the project’s application. The judges approved $40,350 for Somerset, followed by $20,500 for Yates, and $9,500 for Save Ontario Shores. The entities are expected to be approved for another $200,000 in intervenor funds if the application proceeds. Those funds help the towns and citizen groups hire experts and lawyers to review the application. Simon said the two towns have passed local laws to keep the turbines from within 3 miles of the shoreline and at least a half-mile from residences and a half-mile from the property lines of landowners who don’t have leases with Apex. The company is planning for turbines that don’t meet those regulations. “None of the turbines are legal,” said Yates Town Councilman John Riggi, citing the setbacks and lake buffer zone. Yates has $20,000 budgeted for legal costs this year. That includes $8,500 to Andrew Meier as the municipal attorney. The town has nearly maxed out the $20,000 this year, Simon said. Next year, Yates has budgeted $18,000 for legal costs. Next year Meier might not attend many of the Town Board meetings and instead be available by phone, which will reduce his costs. Simon said the intervenor funds will help with the legal expenses if Apex proceeds with its application. The town supervisor said Yates needs to protect the community from the project and fight for the integrity of its municipal laws.